Easy Instant Pot Spaghetti Sauce–this spaghetti sauce is so delicious you’ll be licking your plate. The funny part is that it only takes a handful of easy ingredients and a few minutes in your pressure cooker. 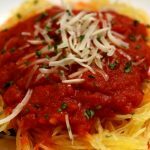 Bonus–if you want to cook a spaghetti squash at the same time as the sauce you can! I can’t get over how delicious this spaghetti sauce is! We’ve had it two times in the past week. The first time I served it over spaghetti squash and the second time over regular spaghetti noodles. A friend gave me this recipe and said it was like “pure comfort food.” I was skeptical that it would be that wonderful since it had just 4 basic ingredients. But she was right, it was super tasty. The first time I cooked the spaghetti squash in the same pot and at the same time as the sauce. It worked perfectly. The only thing is that you’ll need to pick a smallish spaghetti squash or it won’t fit in the pot. The second time I cooked spaghetti at the same time as the sauce using the pot in pot method. It worked fairly well but the noodles did stick a little. I still need to experiment with that one a bit! Try out this marinara sauce the next time you make spaghetti instead of the jarred stuff from the store. I bet you’ll really love it! Instant Pot Zucchini Linguine-a fresh summer dish, I’ve been making this dish for so many years! To make Easy Instant Pot Spaghetti Sauce I used my 6 quart Instant Pot Duo 60 7 in 1*. I love this Instant Pot because it has the yogurt making function which I use almost weekly. It has two pressure settings (high and low), and there are also little slots in the handles so that you can rest the lid there instead of putting it down on your counter-top. This spaghetti sauce is so delicious you’ll be licking your plate. The funny part is that it only takes a handful of easy ingredients and a few minutes in your pressure cooker. 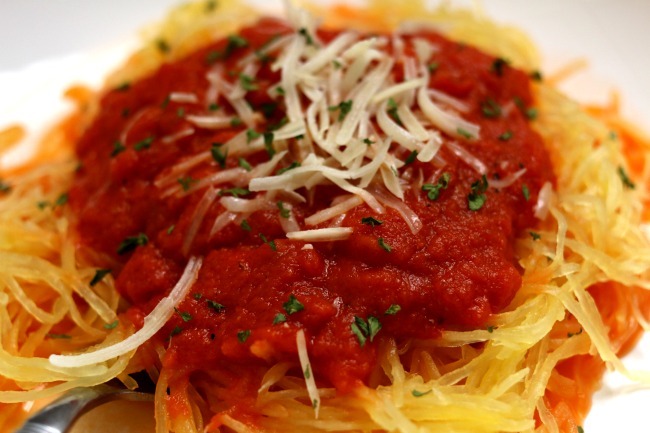 Bonus–if you want to cook a spaghetti squash at the same time as the sauce you can! Add tomatoes, butter, onion powder, garlic powder and salt to Instant Pot. Optional: If making a spaghetti squash, use a paring knife to cut your spaghetti squash in half crosswise (not lengthwise). Use a spoon to scoop out all the seeds and gunk. Place a trivet inside the pot and then arrange the 2 squash halves to fit in the pot. Cover the pot and secure the lid. Make sure valve is set to sealing. Set the manual/pressure cook button to 7 minutes. Once the time has counted down and the pot beeps you can perform a quick release by moving the valve to venting. Remove the lid. Use tongs to remove the squash to a cutting board. 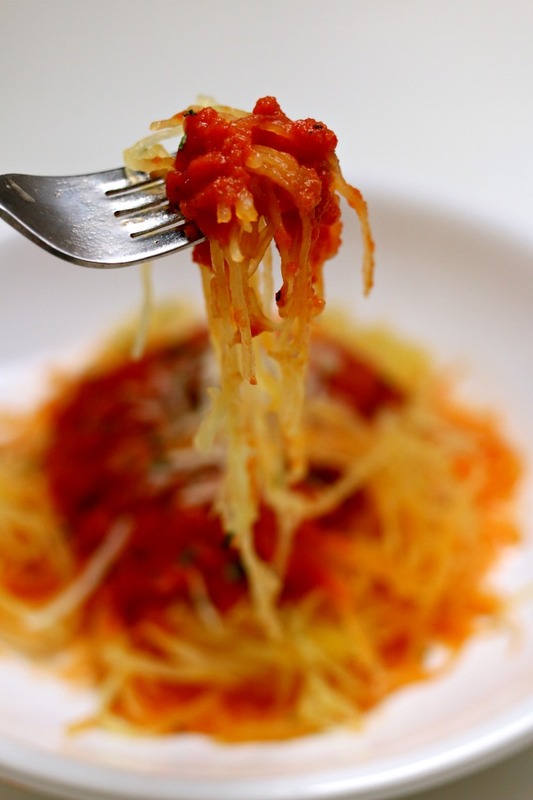 Once it has cooled, use a fork to shred the flesh of the squash into long spaghetti-like strands. Use a immersion blender to blend the sauce to desired consistency. Salt and pepper the sauce to taste. Serve the sauce over spaghetti or spaghetti squash and top with generous amounts of parmesan cheese. Like this recipe for Easy Instant Pot Spaghetti Sauce? Get all my new recipes delivered to your email inbox by signing up below. Hello and thank-you for all the amazing recipes! Pertaining to your IP spaghetti sauce post, have you or can this be made with fresh tomatoes? If so, how? I personally haven’t made it with fresh tomatoes but I bet it would be amazing. You would probably want to get the peels off of the tomatoes first. Then add as many as you’d like to the pot. My only concern is that it wouldn’t come to pressure. So you may want to add in a cup of broth first and then the tomatoes. Think I will make this for tonight and there should be enough left for tomorrow too. Sounds delish thank you. I’d brown it first on the saute function and drain off excess grease. Then add in the rest of the ingredients and cook as stated in the recipe. Can you add a lb. of ground beef to this sauce? Sure! Brown it first and drain off the grease. Nice take on Marcella Hazan’s famous sauce! I love to see recipes like this adapted to the pressure cooker. Would you cook the sauce for the same 7 minutes without the squash? Would shorter or longer suit it better? ha! shows how much I know. I didn’t even know it was her sauce. Just keep the time at 7 minutes. Love your recipes, from both slow cooker and instant pot. You’re welcome! Thanks for following along.